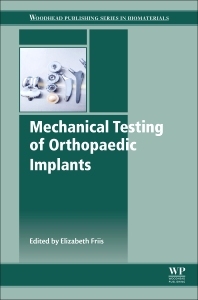 Mechanical Testing of Orthopaedic Implants provides readers with a thorough overview of the fundamentals of orthopedic implants and various methods of mechanical testing. Historical aspects are presented, along with case studies that are particularly useful for readers. Dr. Friis serves on the Editorial Board of The Journal of Biomedical Materials Research - Part A since 2007. In 2004, Dr. Friis was a Kauffman Entrepreneurial Faculty Scholar and was in the charter class of an entrepreneurial development program (PIPELINE) in 2007. She served as the Director of the Graduate Fellowship Program for the Institute for Advancing Medical Innovation from 2009 to 2011. Dr. Friis has received several National Science Foundation and National Institutes of Health Small Business Innovation Research awards, and has licensed technologies that are currently commercialized.